Choosing what we should do can be harder than we first think. Of course, deciding which things are good and bad is relatively straight forward. However, we are still left with far too many possibilities for action, all of which are good. Naturally, if God tells us clearly what we are to do, then it should not be to tricky to see the way ahead. This model is designed to help us in the absence of such a clear indication and can be used by individuals, teams and organisations. The model itself draws heavily on business strategy models which consider competitive analysis. In this case, however, the comparative analysis is not done to see where we might best compete with another individual or organisation, but instead to help in understanding our strengths. Hopefully, it enables us to understand where we might be strongest and therefore what it might be best for us to pursue. The underlying assumption here is that if we can be clear on how God has built and gifted us, we will better understand what He wants us to do. The model takes the form of five questions, to be asked and answered iteratively. We decide for ourselves where we enter the circle. We then process around the loop until we have reached some ideas, being waryof the temptation to go round in circles too much and never make a decision. Bible – what is does scripture say? Gifts – what are we better at than others? Resources – what do we have more of than others? Know – what do we know more than others? Need – What are the biggest needs in the community we serve? It is worthwhile considering close and distant comparisons. Here are examples of each. First, it seems to me that one comparative advantage churches have over other organisations (distant comparison) is volunteers. Churches have an incredible base of people willing to serve for free. How can they use that to make a difference? Second, a church might discover that it has a lot more people gifted in counselling victims of abuse, when compared to other churches (close comparison). Such a church would need to consider if they should specialise in such a ministry? 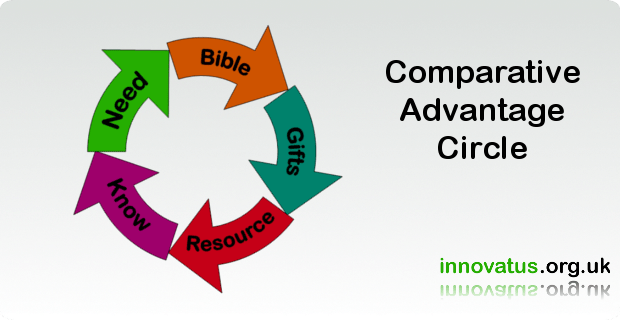 Please feel free to share any of your own examples of using the Comparative Advantage Circle, as an individual, team or organisation. « Where do good ideas come from?